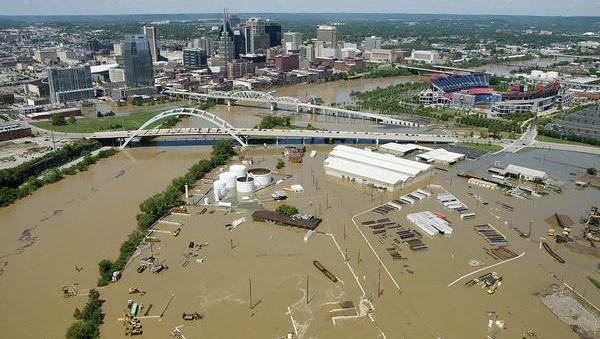 A 1,000-year flood slammed Nashville, and downtown, in May 2010. NASHVILLE, Tenn. – In wake of the devastating and tragic flooding in the Houston area we extend our heartfelt thoughts and prayers and stand ready to send any available resources, when requested, as we know the damage and trauma massive flooding can cause. In that spirit we must always stay vigilant and ready to combat the destruction of natural disasters as they can happen without warning as shown in the heartbreaking floods of Houston. During the 2010 flood in Nashville, the need for improved communication and easily accessible and interpreted data was realized. In response to that need, the Nashville Emergency Response Viewing Engine, NERVE, was developed. NERVE is a free online tool to provide information to the public during a natural or man-made disaster. NERVE is an interactive mapping site that provides real time information about road closures, school closings and locations of emergency shelters, food and water distribution centers and Disaster Assistance Centers. NERVE can also help navigate residents to the closest shelters and other emergency resources by routing them around closed roads. NERVE can be found online at http://nerve.nashville.gov at any time, but is only active during an emergency when the Nashville Emergency Operations Center is activated. We encourage you to be familiar with NERVE and utilize it to stay informed and safe during a natural disaster. Flood related information shared on NERVE is obtained through Nashville SAFE, Situational Awareness for Flooding Events. The SAFE tool was also developed by Metro Planning/GIS, along with U.S. Geological Survey, the Corps of Engineers, National Weather Service and Metro Water Services, and serves as an internal mapping program that collects flood related data and displays it in a single viewer. The tool is used by trained Metro Water Services personnel and provides necessary data needed by emergency personnel in making prudent decisions in anticipation of and during flood events for public safety. A demonstration of NERVE and SAFE will be provided to the media at 11:00 AM on Thursday, August 31, 2017 at the Development Services Center Conference Room, 800 2nd Ave S. Nashville, TN 37210 (1st floor past the elevators).